Been out couple of times, quick to rig and lets me go anywhere I want on the lake! Ace! Only prob I've had so far is with the rudder popping out of mount at the back- this lead to the top mount becoming bent. I've tried to bend it back- any suggestions? Other than this... very happy indeed! Out of interest, how much did it cost if I may ask? I've also wondered whether I should save myself the time and bother and just pay them to do it, but it's not in my nature to pay someone for something I can do. Probably why I'm constantly doing DIY around the house and fixing stuff rather than in my canoe having fun! All-in-all including fitting it was just over 600 quid (dont tell my wife ). I'm not very practical so i was better earning money from canoe-coaching and spending that having someone else do the work. For many people the self-build is a joy unto itself, my respect goes out to them but thats not me. My advice- if you're anything like me with DIY get in a professional! Glad to hear you're liking your sailing set up, but surprised that there has been even a minor but irritating problem. I'm sure Dave S will help sort it out. Are you sure you are rigging it properly? I think the rudder blade control lines should hold the thing down. Do you have any pics? That FB link doesn't work for me. It's a great sailing set up you have there Adventure 7, I'm not surprised you're pleased with it. It's very similar to what I have currently (other than a different canoe as a base) and I've been delighted and impressed by how capable mine is. I don't regard myself as a particularly capable DIYer but I was able to fit the bits to my canoe myself without any problems (albeit Dave S supervised me while fitting the rudder mounts). I think you may have to alter the privacy settings on your Facebook link if you want to share it with others on here (as windorpaddle says its not working at the moment). I hope you get your rudder glitch sorted soon. The only way that the rudder could have come apart in use is that you put it on wrong. 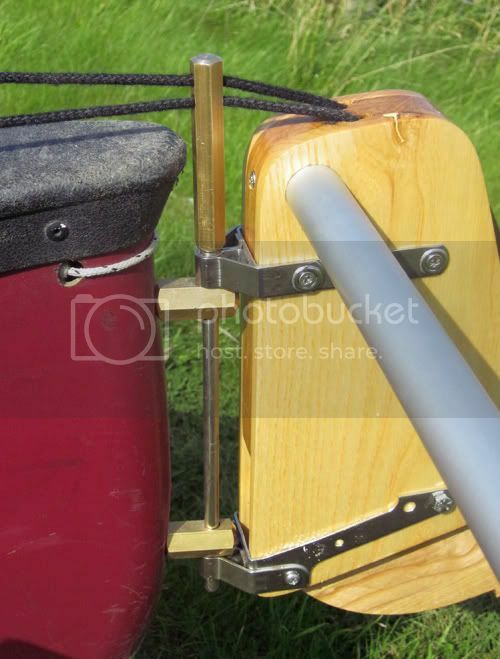 The pivot pin goes through the gudgeons on the rudder and the rudder fittings on the canoe. If the fittings on the rudder go between the fittings on the canoe the pin holds them together and the rudder cannot lift off. 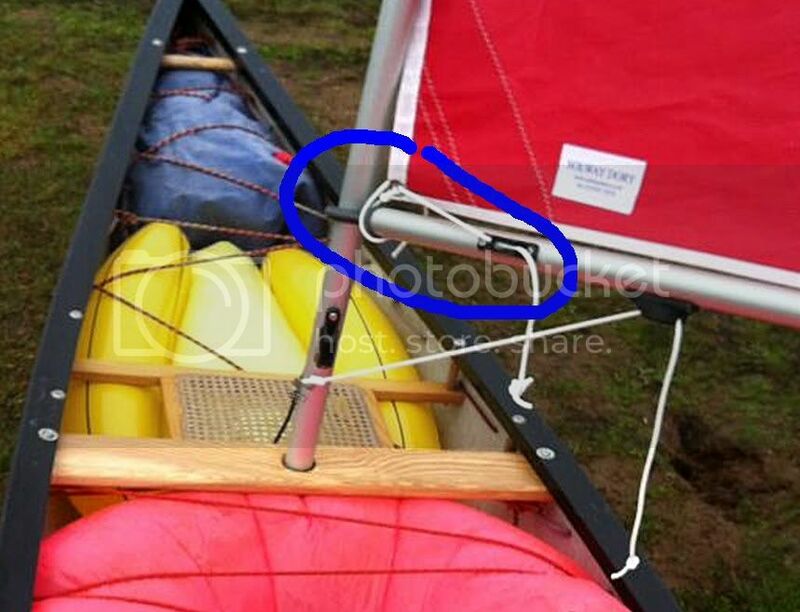 You must have put the rudder fittings on top of both fittings on the canoe. The rudder can then lift up and the pin come out of the bottom boat fitting, The rudder is then only hanging on the top fitting and will have bent this. We can send you another top rudder fitting, if you cannot straighten it. E-mail me and we can sort this out. The fittings that we put on your canoe are the stainless strap fittings as your Peace River Cruiser has a very narrow stem. They are just bolted on through the sides. Hi Dave, I think you're spot on with your comments. I must have put it on wrong on my last trip, and I think when i launched it it took a bump and raised it up a bit. I took her out today and had no problems :-) Force 3-4 wind with the sail reefed like you showed me. I had the most amazing time... was laughing hard! because my lake is only small i had trouble getting the leeboard down and the rudder set before being pinned against the other end of the lake, but once i had everything set i was sailing realllllllllllllly fast. i am delighted with my set-up and would recommend it to anyone. instant adventure - which is great when you only have an hour or so to play with! Last edited by Adventure 7; 22nd-January-2012 at 05:25 PM. Last edited by Adventure 7; 22nd-January-2012 at 06:03 PM. Good to hear that you are getting out and enjoying it. Hope your inflatable bananas and punch bags are well tied in. Yeah that does look like a nice set up, it sounds like you're enjoying it to the maximum as well. Great stuff! All the sailing canoe you should ever need. Does it all really, enjoy. Question for Dave though. Dave I noticed that his boom has an extra cleat attached near the mast. Is this to enable the rig to reef on the hi-spec Expedition 35's or is it for something else? Just wondered. The Tack doesn't seem to be pulled down in any way tensioning the Luff? The extra cleat is for a downhaul, and Adventure 7 has missed it out. There is a separate line from the Tack and instead of it going to a hook on the mast and being tensioned with the halyard like yours, it can be tensioned separately. The high spec Expedition rig has more bits on it to make it more controllable, but at an extra cost. With your sail, the downhaul is of fixed length and is tensioned with the halyard. With the reefed sail you can set it at different heights when reefed as you have spare mast above the sail, so the adjustable downhaul alows you to tesion the luff whatever height you raise the sail. Oh I see, thanks Dave.